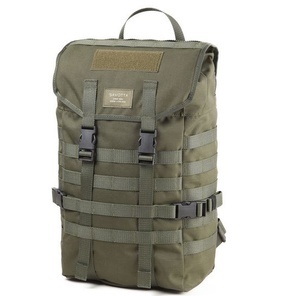 Made in Finland, this excellent and well made 1000D cordura backpack is versatile and strong. 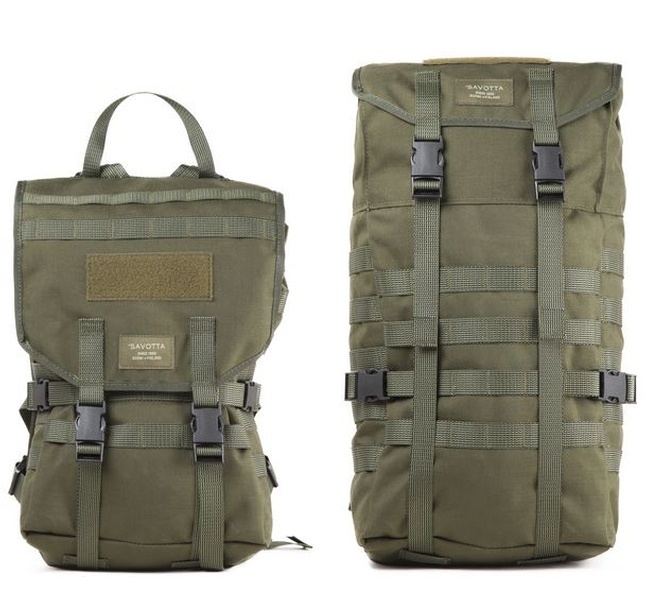 The 22L pack is a great day pack, offering simple top open design, but with added features including separate compartments, easy slide supports and lots of MOLLE webbing!. Minijääkäri is the Jääkäri product line’s smaller daypack. An extensive amount of customer feedback and wishes were taken into account in its design. The Minijääkäri is your best ideas and our expertise brought together in a small, compact package. The praised functionalities and overall look of the Jääkäri backpack were not abandoned for this smaller version, and at its core the Minijääkäri is simply a lighter and smaller version of its praised predecessor. At the same time, it is our vision of what the ideal version of a small daypack should look and feel like. Every detail and function has been considered and tested extensively. Don’t let the small size fool you: the Minijääkäri is a highly versatile and adaptable daypack that you can rely on in both urban environments and deep in the forest or jungle. Minijääkäri is also highly modular: it is fitted with the MOLLE pocket attachment system and compatible with a vast range of additional accessories, such as (all purchased separately) detachable straps, chest straps, hip belts, additional padding, back supports, etc. which can be used to make the Minijääkäri even more versatile. Minijääkäri is not just a small daypack, but rather a versatile tool, perfect for any highly-mobile individual. Thanks to its compact size, this backpack will not be in the way even in cramped spaces and it is ideal for bicycling, running, skiing and hunting. In addition – assuming you don’t mind a few extra grams – the Minijääkäri also makes a great and durable companion for any extreme sport. The bag’s compression straps can be tightened to ensure it sits firmly and does not jiggle around. The Minijääkäri also serves perfectly as a carry-on bag. The Minijääkäri’s bag has been designed to be slim but still spacious enough to hold the necessary supplies for a day trip. The opening of the bag is closed with a folding flap which enables overpacking as well. When closed normally, the bag’s opening folds approximately 10 centimetres over the front together with the flap. This ensures that packed items stay inside the bag securely and tightly and it also helps keep water out. The folding opening and lengthy straps enable considerable overpacking. The main bag adapts in a stepless manner and has a capacity of 18–22 litres. There is a zipped pocket inside the flap for small items and valuables, which can be used to store items such as your toothbrush and passport (dimensions: 15 x 25 cm). The bag’s opening has been reinforced with ethylene support pads that ensure you won’t waste time getting the bag open and items out. Inside the bag, there is a separate pocket (dimensions approx. 23x37cm) for a hydration bladder or supplies that need to be kept separate. This pocket will easily hold, for example, a contemporary 13.3-inch laptop or any smaller pads and gadgets. The pocket’s opening is closed with an elastic band. This ensures that items stay in and don’t move around when you do. A hanging loop found in the upper part of the pocket can hold items such as a hydration bladder safely and securely. On each side of the bag protected under a flap there are outlets for the tubes of a hydration bladder or, for example, a cord or aerial. Compression straps found on the backpack’s sides can be used to tighten the bag into a compact shape even when it is not full. The same straps can also be used jointly with additional straps for attaching long items to the bag. No Jääkäri is complete without the modular structure provided by PALS webbing familiarly known as “MOLLE”. PALS/MOLLE is an attachment system used by the military in almost every country. This attachment system has been created for conditions requiring unconditional modularity and durability. The very Finnish-sounding MOLLE is an acronym for: Modular Lightweight Load-carrying Equipment. PALS, on the other hand, stands for: Pouch Attachment Ladder System. By applying this technology, the Minijääkäri backpack has been made into a cutting edge modular package. MOLLE webbing can be found on the Minijääkäri’s front, sides, flap and even on its shoulder straps and hip belt. With MOLLE, you can attach any pocket compatible with PALS almost anywhere you want on the Minijääkäri. Using additional pockets, the Minijääkäri can be modified into a tactical tool that is suitable for a range of professional uses. In addition to its modular attachment possibilities, the MOLLE webbing reinforces and stabilises the backpack. 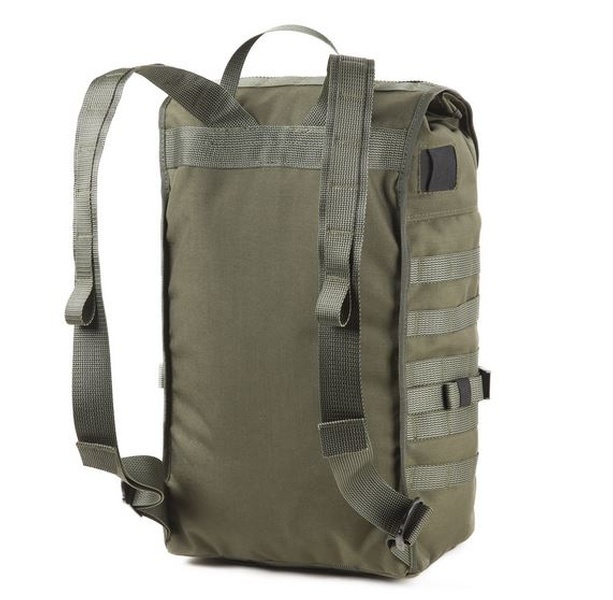 One MOLLE loop on the Minijääkäri backpack can bear over 100 kg of weight. The attachment straps of the flap are long and run along the whole front of the backpack and under it. If necessary, a 25 mm strap dives nicely along the MOLLE webbing and can be lifted to the surface wherever desired. This enables the tying of supplies securely on the front of the backpack without additional detachable straps. The bottom of the backpack has four guide loops for straps which enable the tying of equipment to the bottom of the backpack as well. Tying to the bottom is an excellent carrying method for rolled sleeping mats, for example. The front (flap) of the Minijääkäri has a sown patch with Velcro (size: 5×13 cm) that can be used to attach a name, flag or any other patch. It is also possible to use the bag’s side straps to fasten items that would not otherwise fit in the backpack to its sides. The compression straps have been sized to be long enough to extend over the backpack all the way to the opposite attachment point, if necessary. The slim and comfortable 40 mm wide shoulder straps are sturdy, but do not hinder movement. 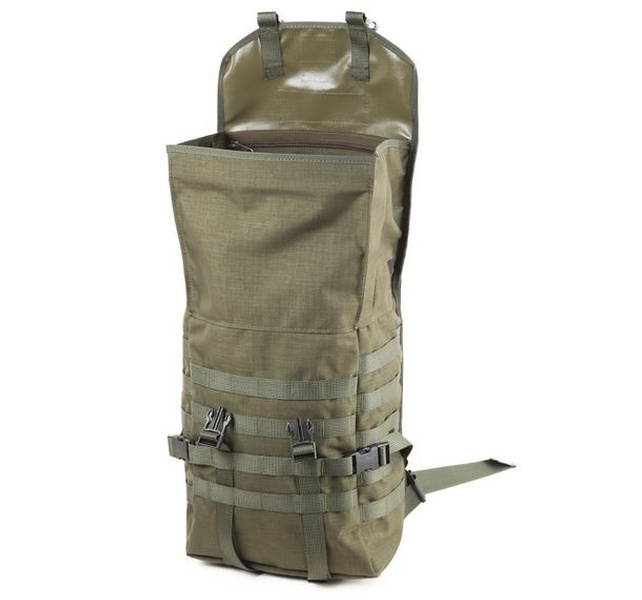 The shoulder straps are also fitted with MOLLE webbing and can be used to hold small accessories, a chest strap or the tubes of a hydration bladder. The top ends of the straps’ MOLLE webbing include hanging loops that can be used to attach karabiners. With the carrying handle on the top, the Minijääkäri backpack can be carried easily by hand as well. Using separate accessories, such as a chest strap or hip belt, shoulder strap pads and/or hydration bladder pocket pads, the Minijääkäri’s carrying system can be modified easily to suit user-specific needs and preferences. External dimensions: height 45 cm (55 cm when overpacked), width 25 cm, depth 16 cm. Capacity: adjustable between 18–22 l.
Materials: 1000D PUR coated Polyamide fabric (Cordura/Codura), Delrin special plastic buckles and 8 mm coil zippers. Purchase through PayPal by using the "Add To Cart" button above or use the form below to order the Savotta Finnish Bushcraft Day Pack . Feel free to contact us if you have any questions about the Savotta Finnish Bushcraft Day Pack .